Never underestimate the power of hot food. The sloppy joe meat was good. It was a restorative lunch. Getting the banana today was a sweet bonus. 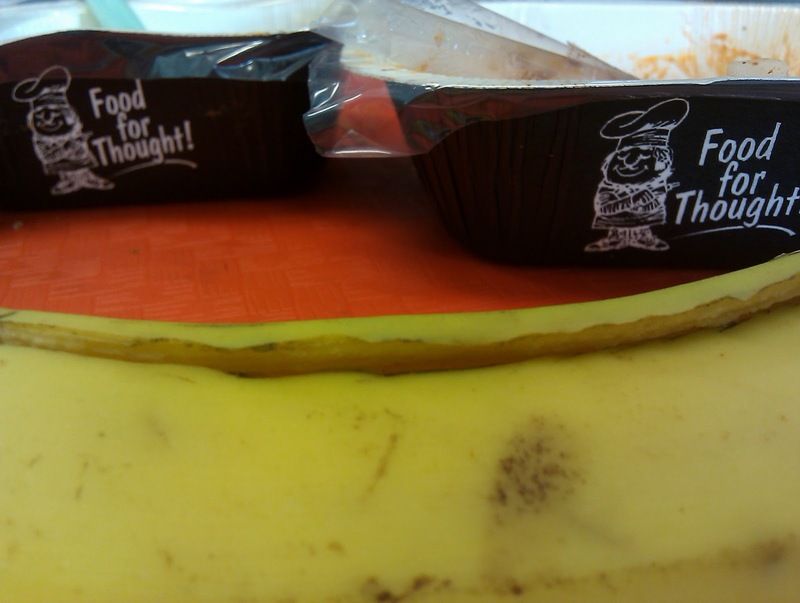 From the banana’s perspective there is a lot to think about! I develop my nightly post in my head while driving from school to daycare to get my son. Yesterday I was thinking about the exchange I had with my friend, who happens to be a co-worker and janitor. What I should have included in my story yesterday was that I had a very different chat with another co-worker, a teacher, about the bagel dog. Her response was to shrug. She didn’t care that the students eat bagel dogs, hot dogs, and chicken nuggets as their best meal of the day. I also had a different chat with yet another teacher who told me that she could not afford to buy organic fruit and veggies for her family. I respect that. Part of why I appeared to be astonished by my conversation with the janitor was that in my mind it was in contrast with other conversations I have had. We chat every day, but it was refreshing to connect with him specifically on food issues. I was encouraged that he was so into what I am into when I haven’t always found that to be the case with other people in my work environment. I write these posts immediately after my son goes to bed. Sometimes I have very little energy left. If you don’t blog you don’t know that daily blogging is a challenge for a working parent. I get sleepy when I’m rocking my son to sleep. Then I have to wake myself up before I come out to the front room/play room/my desk area to file my daily report with the bureau…who aren’t always kind critics! A medium-sized woman turns off lights and closes large door of classroom with a little peeling paint and old chairs and desks. She is tired, hungry, and a little sweaty after a long day with the students on her feet. She looks back into her room, scanning to make sure it’s ready for the next day. The nice stuff she sees was all purchased out of her own pocket. Mrs. Q heads out to the parking lot where she gets in a Ford that happens to be the exact same make and model as the janitor owns (I know that only because he saw me in my car and shared that with me). My paternal great-grandfather abandoned his family. Overnight my grandfather became the man of the house and in charge of his mother and six siblings. So he left school in 8th grade to work and support the family. Grandpa started working as a stock boy at a local department store sweeping the floor. He married young; he and my grandmother (who also left school) had five children in five years. My dad was their first child. The family didn’t have any money, but my grandpa worked his way up in the department store. My dad got a scholarship to college, which he proceeded to lose when he failed out his second year. He went back home, worked a hard labor job to earn enough money to pay for his schooling and by the grace of god, he got his grades up and got his scholarship back. My dad was the first person in the family to get a college degree. He became a math and science teacher (that was his first career). Haven’t most of us come from meager means? You know: “Give me your tired, your poor, Your huddled masses yearning to breathe free,The wretched refuse of your teeming shore. Send these, the homeless, tempest-tost to me, I lift my lamp beside the golden door.” I love that poem. If you go back far enough in anyone’s story, you are going to find poverty, exhaustion, hard work, just like what I detail above from my personal history books (and that’s only one little part of me). You’d have to look pretty hard to find an elitist among my family. It’s certainly not me. People who don't like your blog should just go elsewhere –we won't miss them. I appreciate that you are often so vulnerable with your thoughts on this blog. I hope you don't change because a few like to censor others for what they read into it through thier own bias. The foodie trends HAVE trickled down through a socio-economic filter – and I think you made a fine point that the trickle down is now a mainstream trend accessible to the Everyman – not just hippies and academia. I loved what you have to say. It is true, many of us have immigrant ancestors who first came to the US in search of a better future. I know my family did. I'm glad that you enjoyed the sloppy joes because quite frankly they didn't look very appetizing. I guess that you can get used to what you have. The thought that people would consider an educator in the public schools as an elitist is simply hysterical. We are givers. We tend to have open minds. And even if we don't agree with others, we try to find a teachable moment anywhere we can. I never understood the need to post negative thoughts or comments about a person's blogging. Like Renee said, just go elsewhere. No one is making you read this. Simply find a blogger that suits you better. Keep up the good work you're doing Mrs Q. We appreciate it and the children will appreciate it when better food ends up on their trays. If not now, as they get older and realize the importance of healthy food. Just love your personal tidbits as well. Please keep them coming! Switch the paternal and maternal sides and that sounds similar to my family. I really liked today's post, nice insight. I don't always have the same opinions as you do, but I respect your writing and honesty and I enjoy coming back. As a fellow blogger (and civil servant), I know how hard it is to get something down before you doze off! Undercover caterer – Thank you for saying that you don't have the same opinions as me. I don't expect everyone to agree with me! I'm just one person and not much of an authority on anything. And for the record, I read yesterday's post as well, and had nothing bad to say in response. But I really love this one. On a personal note…going to college was never an issue for me or my siblings– we just have always sort of expected it. My dad got his bachelor's and master's degrees immediately upon graduating from high school; my mom didn't quite finish college the first time around, gave birth to and raised three children, worked as a secretary and dispatcher in the hospital, and then by the time I was 14 years old had gone back to school and completely (while working full-time with us three kids at home). And only now, at 22, getting ready to graduate and begin a teaching career, have I really stopped to consider what a privilege my college education really is. I never bothered to ask until a few weeks ago what my grandparents and great-grandparents did before they retired– I knew my grandfathers and great-grandfather had served in the military, but had never really thought about the details of their lives. They all worked so hard, most of them without college degrees. I am so thankful for their hard work and for their support as I have pursued my own dreams. I come from families of self-made people as well, and my dad put himself through college. Am I the only one who thinks this could have been two meals? I make rice and bean dishes. And sloppy joes, but don't think I would make both. Here's what I don't understand… how is healthy food elitist? Someone who says that they can't afford to buy organic or whole food is choosing to spend their money on something else, which is okay, but just call it that. As a nation, we spend less on food than any other industrialized nation, which isn't surprising, just sad. Food fuels our bodies and protects our future. Growing it in harmony with the land protects jobs and our earth. You should not have to defend your personal history. If they think you're a snob, so be it. Those who want to continue to read, and who have stuck with you throughout this project, will give you credit for statements that could be construed in other more negative ways. I don't think I've ever commented before, but I do read your blog pretty often. I read yesterday's post and today's and felt like I needed to weigh in. Sometimes you annoy me and it's not because I think you're snobby. I think its because you, quite frankly, seem judge-y a lot. That has nothing to do with socio-economics or education or anything else people slammed you for in the last post's comments; it's just the tone of your writing sometimes. That being said, I still read your blog because I grew up in a very impoverished area of Appalachia. 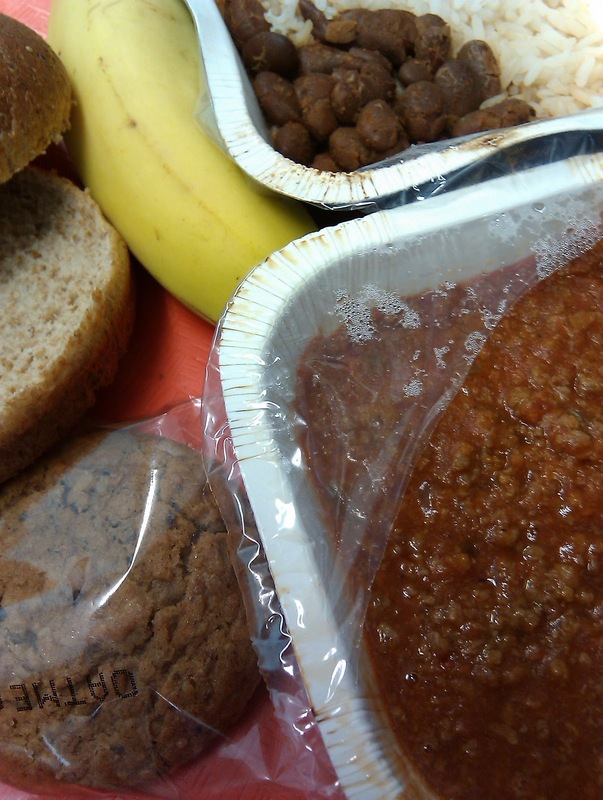 For a lot of my friends, the breakfast and lunch they got at school was the only food they had all day. I know that's still the case for a lot of kids out there and I respect your effort to raise awareness about the extremely deficient school lunch program. "Someone who says that they can't afford to buy organic or whole food is choosing to spend their money on something else, which is okay, but just call it that." Whole food? people on food stamps can prob afford to live on rice, pasta, beans, and frozen vegetables. All Organic food? Forget about it. Many people cannot choose to spend more than they already do on food for a variety of reasons (Medical bills, car repair, tight budget with no room to give). If it comes down to eating regular fruits or vegetables instead of organic means your power stays on, I think its a no brainer. Yes, I never understand the people who claim that wanting to eat real food is some kind of "elitist" philosophy. So they will justify eating crappy junk food with the argument that they can't afford to eat like "foodies" (or whatever else one may call people who cook their own food). It is always cheaper to cook food than to eat out, and it doesn't have to take much more time. And many of us eat try to real food most of the time are no richer than those who don't – we could be janitors, teachers or anything else. P.S. Today's meal is one of the better looking ones, compared with the bagel dog for example. I am always happy to see you get rice or pasta; from my personal perspective those look more like real meals. I suppose today you have a bun AND a cookie, in order to have 2 grains, becasue rice doesn't count as a "grain"?!! it bums me out to know that you get bad feedback. basically – blogs are not required reading. so, if you disagree with the poster that's fine, but no need to heckle, put down or barrage with other assorted insults. if it ain't your thang, move on. your journey into what the kids are eating for lunch has brought you on a whole different journey. not just about child welfare, the school system and the like, but about the very basest of human survival – how each of us keeps himself alive. the power of choice. the power of money. the power of FOOD. and the ability to study it's negative and positive effects on your own body. this is your journey – you stop apologizing for it right now! if people don't like it, don't let the door hit em. As a "foodie" who likes to buy organic and think about where her food comes from, and who lives in rural America, I am astonished whenever anyone shares these interests – whether they're the cleaning staff or the boss at my office. Mrs. Q, nothing you said sounded elitist or snobby. Thank you for speaking openly and honestly, and please don't stop! (Although I, for one, wouldn't blame you a bit for taking a day off of blogging every now and then…). Thank you for giving more context to your conversation with your school janitor. Sorry that so many people jumped to conclusions and judged you for what you wrote yesterday. The thought of good nutrition as a wealthy/poor or educated/uneducated is interesting to me. I suppose it's all about choices, and prioritizing how you spend your money. Obviously the more money you have, the more choices you have (not that it means you will make healthy choices). The less money, the more you have to make hard decisions on how to spend that money. @LM-I think you're missing the point that some people don't have money for food, period! And some people barely have enough money for good, so spending the extras on organic, etc. is simply not an option. Try working for minimum wage and supporting two kids as a single parent. You'd probably have a different perspective then. @Mrs. Q-Loved this post, and I certainly didn't see anything wrong with the original post. While I enjoyed hearing about your family's history, you certainly don't need to defend yourself. I don't normally post but just wanted to tell you that I read your posting yesterday and I didn't find anything wrong with it. I love finding other foodies. Sometimes people reflect their own insecurities on others and it makes the lash out. To repeat what other posts have said, if you don't like it go somewhere else! Health does not correspond with wealth or education. Life is all about priorities. Thanks for staying up late nights for our entertainment. Best Wishes. Growth often springs from conflict, if your feathers get ruffled then maybe stop and look in for a minute and try to understand why. This blog is getting people thinking, it's getting them talking and hopefully it'll help kids get better food in their tummies. I do not use school lunches, my youngest is at a charter school so that's not even an option, my oldest is in high school and doesn't want to waste his precious 35 minutes waiting in line for junk food. I still read this blog because what other kids eat matters to me. It helps them learn. It helps them stay focused and grow into productive adults….or with the junk they often eat it does the opposite. This directly affects me as an employer, parent and citizen of the States. We need our children to grow healthy and we just may need some feathers to be ruffled to get that done. I hope you don't take too much offense to what a few mean spirited people have to say. They're all entitled to their opinion, sure, just as you are! I enjoy reading your blog, and it's really opened my eyes about what kids are really eating in school. I have a 3 year old who will be starting kindergarten in a few years. I, for one, am extremely concerned about what she'll be eating. I'm grateful for people like you who are willing to take risks for our kids. And as for the folks calling you snobby and an elitist – talk about making me laugh out loud! You've never come across as snobby or anything of the sort to me. At heart, you strike me as a mother and fellow human being who wants to look out for our kids. There aren't enough like you in this world! Please keep up what you're doing. I believe you're making a difference. Did anyone ever think Mrs. Q. was coming from the perspective of the he-man, man-cave beer drinking, wing eating stereotype that we see in every ad and sitcom. Maybe those that jumped to the conclusion that she was lookin gdown her nose are the ones that have the snobby attitude. Also, i don't care what anyones income is a bag of apples doesn't cost much more than a Happy Meal.Perspective and thought is all it takes.Mrs. Q. this is your bblog and you can say what you want if anyone doesn't like to bad so sad, they can go eat some HFCS, ha! Thank you for writing! I really wish I was still in high school so I could join you on this journey. Snobby? Judg-y? Martha, are we reading the same blog? I just want to put in my bid to be on the "Wha??" team. I love this post and am glad you were inspired to write it, but you didn't need to explain yourself. Classism is sometimes in the eye of the beholder. Mrs. Q. I thank you for doing this blog. It is a labor of love. Yes it is entertaining. Even the little spats and disagreements can be eye opening. However, you really don't have to defend yourself. It is your blog. If you want to defend yourself though, go ahead. Just don't spend too much time agonizing over what you are going to say or you will never say it. As for this lunch, it does look like 2 meals to me. If there had been a bit more beans with the rice you wouldn't have needed the sloppy joe and bun. Just a general "What were they thinkin?" Why do "negative" or contrarian comments so often get drowned out by a flood of "Rah-rah, Yay Team, You Go Girl" posts? Whether Mrs. Q agrees with a sentiment or not, considering and discussing "the other side of the coin" can be a really great way for her to strengthen her cause and solidify her own arguments. Blaring out dissent and all things "other", though, while completely within any commenter's right, seems a little exclusive and group-thinky. Mrs. Q, this isn't meant as a criticism of you or your project in any way. You're doing a great job here and you're clearly a thoughtful, caring person. I'd simply like to see your cause succeed and your blog be "all that it can POTENTIALLY be," as opposed to the clique-iness it often comes across as. as far as choosing to spend money on food, i know that there are people who literally have no way to choose healthy food, especially those in food deserts. however, most of the people i know who regularly order off the dollar menu–who come from various socioeconomic backgrounds–tend to spend their money on their hair and nails, cigarettes, cable or satellite tv, and/or car payments, none of which are necessities in my life. it all comes down to one's priorites w/ both time and money. I seem to only comment when other commenters make me angry and that isn't right because there are many posts I have found informative/inspiring and I should have said something positive on those. I greatly appreciate this blog, I think you are providing a wonderful "inside" voice on an important issue. I do have to say I disagree with some of the voices here charging elitism and others calling people out for cheerleading when they are simply expressing their support for your project. I grew up poor in West Virginia. My parents always told me I had to go to college but they also told me they couldn't pay for it. I was lucky, I got scholarships and managed to hustle loads of jobs so I could actually get my masters degree. As someone said earlier, yes many of us growing up in that part of the country were hungry and school lunches helped but that doesn't change the fact they weren't healthy. I think you make a great point that even economically strapped families deserve better food and we, as a nation, must address this in funding for school food programs. Your willingness to bring this issue to light and to call for change is anything but elitist. It's responsible, reasonable and right. I'm just catching up from being away for a couple of days. I think it's a pretty big stretch to interpret your entry yesterday as snobby or elitist. It didn't hit me that way at all. 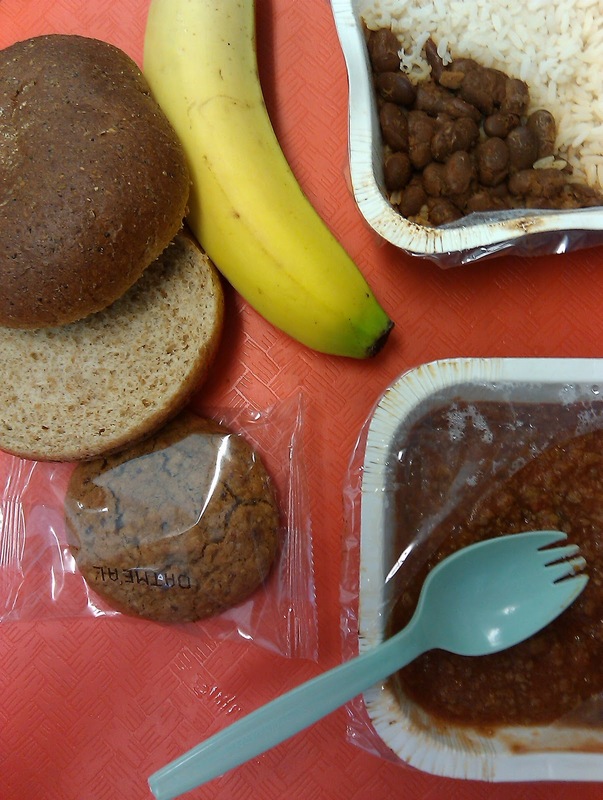 A bun, rice, and a cookie….this lunch looks like end of the week grain count catch up. The obsolete food pyramid strikes again. @ HenrysMom A2MI: I said not snobby. At least that's what I meant to say. If you don't see judge-y that's your opinion, but certain posts, particularly the one about fast food (which I abhor btw), seem judeg-y to me. I have to agree that some of your posts seem "judge-y" but damn it this is your blog and that's your prerogative! I would like to see you really stand by your opinions, though. Enough of the back tracking to explain to the few negative commenters that no, that's not what you really meant. I like your blog a lot but you need a thicker skin. Thanks to everyone who commented! I'm still pretty new to blogging and so I take negative comments to heart. I am learning how to grow a thicker skin. I was just appalled when I saw some of the things I saw yesterday and I really couldn't let those people think or say that stuff about me.